Mitral regurgitation (MR) is one of the most frequent heart valve disorders, with an increasing global prevalence. There are two types of MR: primary, degenerative, and functional MR, secondary to ischemic and non-ischemic left ventricular remodeling. Functional MR develops secondary to the mitral leaflets systolic traction as a consequence of changes in the geometry of the LV. The standard treatment of significant MR is surgery, preferably with valve repair. Mitral valve surgery is efficient, although it has a significant risk of morbidity and mortality, more so in older patients with multiple comorbidities. As such, non-invasive repair techniques of organic or functional mitral valve disease have been developed. Furthermore, there is a new treatment option for patients with significant MR: interventional mitral valve repair through the MitraClip system, which consists of the interventional implant of a device that creates a coaptation line between the central scallops of the mitral leafl ets, thus reducing the regurgitant mitral orifice. The procedure can be successfully performed in both organic and functional MR. Globally, 16.000 patients have undergone the procedure and there are studies and registries that demonstrate the efficacy of this technique in reducing the grade of MR and heart failure (HF) symptoms. Hence, we present the case of a patient with HF classified as NYHA IV, ischemic cardiomyopathy with severe systolic dysfunction and severe ischemic mitral regurgitation who benefitted from the Mitraclip procedure, resulting in a significantly reduced MR and remarkable clinical improvement. In April 2015, the patient, who was a 62-year-old male former smoker with diabetes, dyslipidemia and hypertension, came to our clinic for dyspnea at rest and angina pectoris during moderate exertion. Relevant details from his past medical history included anterior myocardial infarction in 2005 treated conservatively and complicated with apical left ventricular aneurysm, inferior myocardial infarction in 2012 treated with primary angioplasty, with two stents placed in the right coronary artery (RCA) and concomitant angioplasty with stent placement in the left anterior descending artery (LAD). The clinical examination revealed dyspnea at rest, with systolic murmur graded IV/VI best heard over the mitral area and discrete bilateral fine crackles in the lung bases on auscultation. The ECG showed sinus rhythm with narrow QRS complexes and inferior myocardial infarction sequelae, and small R waves across the precordial leads, V1 to V4. Transthoracic echocardiography was performed, showing a dilated left ventricle, with apical aneurysm remodeling occupying cca 40% of the left ventricle, akinesia of the inferior and basal inferolateral walls, severe systolic dysfunction of the left ventricle with an EF=30% assessed with biplanar Simpson, severe functional mitral regurgitation with central jet secondary to mitral annular dilatation (44 mm) and restriction of both mitral leaflets (Figure 1). The laboratory studies showed stage IV chronic kidney disease (creatinine clearance = 28 mL/min). The patient is undergoing optimal medical therapy for HF with Carvedilol 50 mg daily, Ramipril 10 mg daily, dual antiplatelet therapy (Aspirin and Clopidogrel), statin, Spironolactone 50 mg daily and Furosemide 40 mg daily. 2D and real time 3D (RT 3D) transesophageal echocardiography confirmed the restriction of both mitral leaflets as the mechanism for the regurgitation (Figure 2) and, in addition, it revealed the most important component of the regurgitant jet at the A2-P2 site, towards the lateral commissure (Figure 4). Coronary angiography demonstrated severe stenosis in the proximal segment of LAD, permeable stent in the midsegment of LAD and permeable stents in the RCA, with no other coronary lesions identifiable during the procedure. Eventually, the patient was referred to surgery in accordance with current guidelines for CABG (coronary artery bypass graft) and mitral valve repair2. His surgical risk score was assessed at 15% with EUROSCORE and at 4% intermediate level with the Society of Thoracic Surgeons score3. However, the patient refused the bypass and mitral valve repair/replacement surgery. Consequently, stent placement in LAD was chosen as an alternative, with good angiographic results. Concerning the mitral regurgitation and considering its severity, symptoms development under optimal medical therapy in an inoperable patient with a life expectancy > 1 year, percutaneous mitral valve repair with Mitraclip system was contemplated2. A transesophageal echocardiography was performed to assess and establish the technical criteria fulfi lled in order to perform the procedure, as follows: the distance from the mitral annulus to the atrial roof over 4 cm, planimetric mitral valve area of 6 cm2 (assessed with real time 3D), mitral leafl et captation Aspiof cca 3 mm. Using simultaneous assessment of two perpendicular planes (X-plane, Philips®) the most significant component of the regurgitant jet was evaluated between the A2 and P2 scallops, towards the lateral commissure (Figure 2). Figure 1. 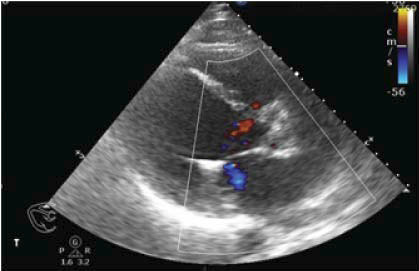 Transthoracic echocardiography (TTE), long-axis parasternal view and four-chamber apical view. Color Doppler examination revealed moderatesevere mitral regurgitation jet. Figure 2. TEE: two perpendicular planes assessment: left image, bicommisural view distinguishing MR with a predominant jet evidenced at the lateral commissure through color Doppler examination; right image, the A2 and P2 scallops are shown, as well as the severe MR jet. Figure 3. Intraprocedural TEE, bicommisural view (left) and long-axis view at 120 degrees (right). Positioning of device at A2-P2 is visible. Figure 4. 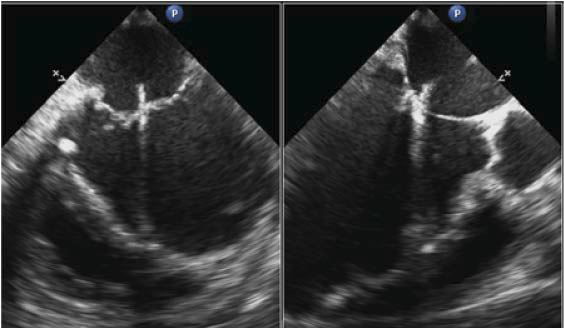 TEE long-axis view at 120 degrees, color Doppler examination with preoprocedural severe MR visible (left) and minimal MR after A2-P2 connection with MitraClip system (right). Figure 5. 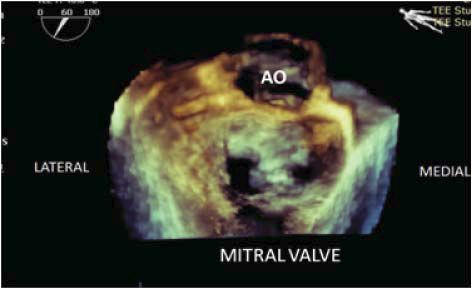 RT 3D TEE with 3D view of the mitral valve from the left atrial perspective; the central connection plan of the two mitral leaflets at the A2-P2 site is visible, leaving two openings in the valve. Figure 6. TTE parasternal long-axis view with color Doppler examination – reduction of the MR jet to minimal. Therefore, the procedure was performed under general anesthesia in the angiography laboratory, under 2D and RT3D transesophageal echocardiographic monitoring. Right femoral vein access was chosen. The procedure implies transseptal puncture under TEE guidance in order to place the delivery system of the mitral clip in the left atrium. The device was positioned between the A2 and P2 scallops under 2D and 3D TEE guidance (Figure 3), followed by grasping of the two scallops with the device. A signifi cant reduction of the regurgitation from severe to mild was immediately shown (Figure 4). 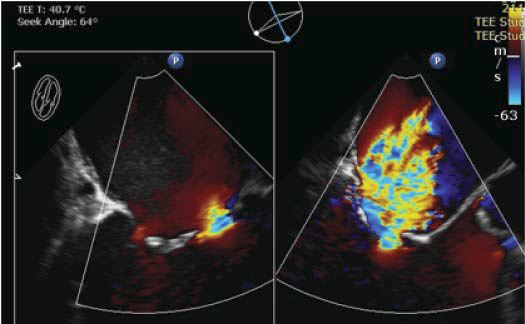 Furthermore, the opening of the mitral valve was assessed by 3D echocardiography to gain view of the two orifices obtained after the coaptation of the A2 and P2 scallops (Figure 5) and by continuous wave Doppler with a maximum gradient of 3 mmHg, thus showing no significant mitral stenosis following the procedure. The device was released, maintaining a mild regurgitation with no further postprocedural complications noticed. The patient was discharged the following day under treatment with dual antiplatelet therapy (Aspirequirin and Clopidogrel), Ramipril, Carvedilol, Spironolactone and atorvastatin. At the one month follow-up visit, the patient had a visibly improved clinical course, with NYHA II functional class assessment. Echocardiographically, the left ventricle remained dilated, with severe systolic dysfunction and an EF=25% and mild mitral regurgitation (Figure 6). Mitral regurgitation (MR) is a very common heart valve disorder4 that additionally contributes to heart failure symptoms, when signifi cant. MR is classified as acute or chronic. Acute MR should be rapidly diagnosed and requires prompt surgery. Chronic MR is further classified as two different categories, the distinction between the two being paramount: primary or degenerative MR is diagnosed if one of the anatomical components of the mitral valve is affected, while secondary or functional MR is diagnosed if the valve is structurally normal, however left ventricle ischemic or non-ischemic dilatation causes displacement of the papillary muscles and traction of the mitral leaflets with consequent mitral regurgitation. The two types of MR, primary and secondary, also have different severity gradings5, and, most importantly, treatment and prognosis are different, as well. If for primary MR surgery is the treatment of choice, its benefi ts in secondary MR are not as evident, when considering MR as part of a more complex spectrum of affl ictions – left ventricular systolic dysfunction, myocardial infarction sequelae etc6. Medical treatment for HF is indicated in both types of MR. Surgical risk assessment is required pre-operatively for this category of patients. A significant percentage of patients with severe primary MR, and especially patients with severe secondary MR associate multiple comorbidities that up the surgical risk score, which practically renders them inoperable. In this case, a non-surgical minimally invasive technique was developed in order to reduce MR. Percutaneous mitral valve repair with MitraClip system (Abbott) has been developed in 1998. The repair method is based on the Alfi eri surgical technique principle of suturing the mitral leafl ets at the site of the central scallops A2-P24. The MitraClip system consists of the percutaneous implant of a device that establishes a coaptation line between the A2-P2 scallops, thus reducing the regurgitant orifice. The benefits of the significant reduction in the severity of MR, quality of life improvement and left ventricular reverse-remodeling have been demonstrated in large studies such as EVEREST II (Endovascular Valve End To End Study), a randomized study comparing the MitraClip system to mitral valve surgery, as well as in other undergoing studies and multiple registries. According to the American guidelines published in 2014, the percutaneous mitral valve repair procedure can be considered in symptomatic patients (NYHA III and IV functional classes) with severe chronic primary MR, favorable anatomy and reasonable life expectancy, who have been, however, assessed with a prohibitive surgical risk score and remain symptomatic despite optimal medical therapy. The European guidelines published in 2012 recommend taking the percutaneous mitral valve repair procedure into consideration in both primary and secondary MR, if eligibility criteria are fulfi lled and if patients are deemed inoperable and with an over one-year life expectancy. Transthoracic and especially transesophageal echocardiography are essential in selecting patients for the MitraClip procedure. Echocardiographic assessment should establish the underlying pathological mechanism and the severity of the mitral regurgitation, the origin of the regurgitant jet and absence of contraindications for the procedure (mitral valve area, present leaflet coaptation, flail dimension etc)8. A notable mention is in order for functional MR, in which case transesophageal echocardiography assessment performed under sedation could underestimate the severity of MR, due to its dynamic character. The same feature is significant during the procedure at the post-delivery of device assessment, when residual MR might be underestimated if the patient is hypovolemic. Consequently, intraproceduralvolemic correction is required. Echocardiographic criteria to perform a successful procedure have been established with the EVEREST I study9: absence of calcifications, mitral valve area 4 sq. cm, length of mitral leafl ets coaptation line 2 mm, depth of coaptation 11 mm. In organic MR, in order to warrant a successful procedure, the fl ail depth should be 11 mm and flail thickness assessed in short axis view should be 15 mm. During procedure, 2D and RT3D TEE is essential, practically guiding the entire procedure, including the transseptal puncture, device positioning and post-procedural assessment. Real time 3D chocardiography has an important role in establishing the perpendicularity of the device to the A2-P2 scallops. In some situations, the residual MR is signifi cant after the implant of the clip, in which case a second clip can be implanted in the vicinity of the fi rst clip. The data acquired from studies support the procedure as having a success rate of over 75%, being relatively secure and well tolerated even by patients in poor medical condition10. The percutaneous mitral valve repair with MitraClip system procedure is a genuine treatment option for patients with symptomatic severe MR despite optimal medical therapy and deemed inoperable for various reasons. The device implant reduces MR in the long term and improves heart failure symptoms. 1. Fedak PWM, McCarthy PM, Bonow RO. Evolving concepts and technologies in mitral valve repair. Circulation. 2008;117:963-974. doi:10.1161/CIRCULATIONAHA.107.702035. 2. Vahanian A, Alfi eri O, Andreotti F, et al. Guidelines on the management of valvular heart disease (version 2012). Eur Heart J. 2012;33(19):2451-96. doi:10.1093/eurheartj/ehs109. 3. Nishimura RA, Otto CM, Bonow RO, et al. 2014 AHA/ACC guideline for the management of patients with valvular heart disease: A report of the American college of cardiology/American heart association task force on practice guidelines. J Am Coll Cardiol. 2014;63. doi:10.1016/j.jacc.2014.02.536. 4. Perlowski A, Feldman T. Percutaneous Treatment of Mitral Regurgitation: The MitraClip Experience. Interv Cardiol Clin. 2012;1(1):63-72. doi:10.1016/j.iccl.2011.09.007. 5. Lancellotti P, Moura L, Pierard LA, et al. European association of echocardiography recommendations for the assessment of valvular regurgitation. Part 2: Mitral and tricuspid regurgitation (native valve disease). Eur J Echocardiogr. 2010;11:307-332. doi:10.1093/ejechocard/ jeq031. 6. Nishimura RA, Otto CM, Bonow RO, et al. 2014 AHA/ACC guideline for the management of patients with valvular heart disease: A report of the American college of cardiology/American heart association task force on practice guidelines. J Am Coll Cardiol. 2014;63. doi:10.1016/j.jacc.2014.02.536. 7. Vahanian A, Alfi eri O, Andreotti F, et al. Guidelines on the management of valvular heart disease (version 2012). Eur Heart J. 2012;33(19):2451-96. doi:10.1093/eurheartj/ehs109. 8. Feldman T, Foster E, Glower DD, et al. Percutaneous repair or surgery for mitral regurgitation. N Engl J Med. 2011;364:1395-1406. doi:10.1097/01.SA.0000410146.91957.d6. 9. Silvestry FE, Rodriguez LL, Herrmann HC, et al. Echocardiographic Guidance and Assessment of Percutaneous Repair for Mitral Regurgitation With the Evalve MitraClip: Lessons Learned From EVEREST I. J Am Soc Echocardiogr. 2007;20:1131-1140. doi:10.1016/j. echo.2007.02.003. 10. Vahanian A, Alfi eri O, Andreotti F, et al. Guidelines on the management of valvular heart disease (version 2012). Eur Heart J. 2012;33(19):2451-96. doi:10.1093/eurheartj/ehs109.